Without a doubt, one of Jamaica's most influential and aspiring Reggae artist to date is also the one that holds the future of Reggae music firmly in her grasp. Jah9 is that woman. And it’s best to be ready for the feeling that one gets when in the presence of pure and utter Reggae royalty, as she is sure to amaze you with the raw sultry vocals so few have been blessed to witness. This highly anticipated event will be held this Sat. March 16th. 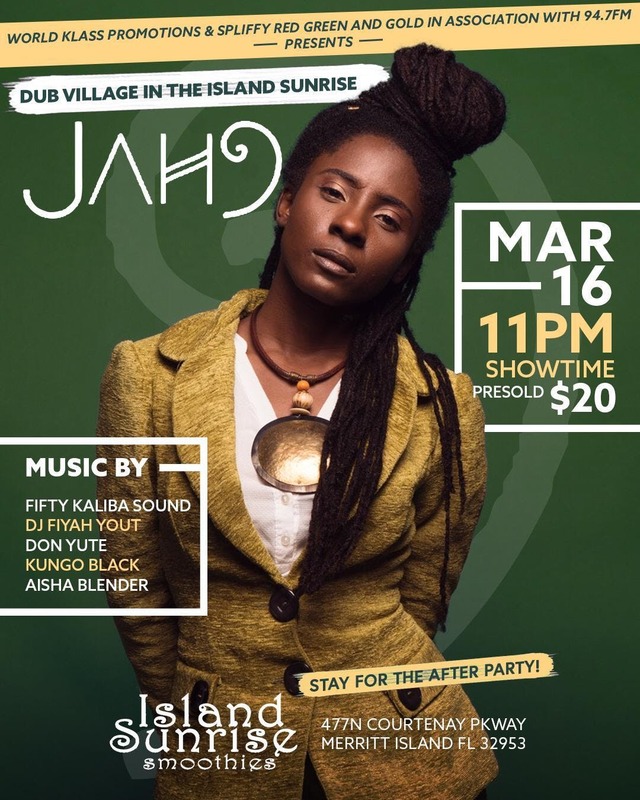 Get ready to bear witness to nothing short of the best in real Roots Rock Reggae, as JAH9 does what only JAH9 alone can do alongside her band, for this leg of her US tour. Also performing will be another true jewel of the Caribbean, ISHA BLENDER. Undisputedly one of Florida’s #1 Reggae bands, Coastal Breed will also be performing. But the fun doesn’t stop there! We also have some of Reggae’s best such as DON YOTE, KUNGO BLACK, with music by ROUGH RIDER INTERNATIONAL, FIFTY KALIBA SOUND & DJ FIYAH YOUT. All brought to you by World Class Promotions, Spliffy Red, Green and Gold, in association with 93.7FM and WorldBeatTv.com, this event is bound to be a Dub Village unlikely to be forgotten!